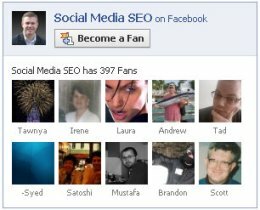 A Facebook Fan Box is a great way to build fans to your Facebook Fan Page directly from your WordPress blog. Having a Facebook Fan Box on your WordPress blog allows for “one click” fan conversions, without people ever having to visit Facebook. Once you’ve clicked “Promote with a Fan Box”, you’ll be taken to the admin dashboard for your Facebook Fan Box. 1) Chose your Fan Page (if you admin more than one page, the drop down will show the pages to chose from) – also, notice that you can select to include “stream” and “fans”. Go ahead and click those on and off and notice the change in the fan box on the right. Basically, you are deciding what content to include in your Fan Box. 2) Next, in section #2, you have the pre formatted options to embed into Blogger or Typepad. For WordPress users, I recommend you chose “other”. You need to click that link to get to the section that will give you the iFrame code for adding your Facebook Fan Box to your WordPress blog. The reason I recommend you use the iFrame code is because of experience. I have found that the standard embed code for Facebook Fan Boxes are not always compatible to all browsers when embedded into a WordPress blog. For example, in Firefox, if you’re using the standard embed code for your Facebook Fan Box in a text widget, then the Fan Box will not always appear to your visitors. They will be presented with an empty white box. So go ahead and click the link called “Visit our wiki for advanced options”. In that section, you’ll see the iFrame code with the yellow background. Go ahead and copy that entire block of code. Now that you’ve copied the code, it’s time to add it to your WordPress blog. Go to the dashboard of your WordPress blog and we are going to add the code into a text widget for your sidebar. So add a text widget to your sidebar – or to wherever you are wanting to place the Facebook Fan Box. Finally, in order to get your Facebook Fan Box working correctly, we need to make a couple of tweeks. 1) You need to add your Facebook Fan Page ID to your iFrame code. You’ll replaced the “YOUR_PAGE_ID” with your actual Facebook Fan Page ID. Find your Facebook Fan Page ID simply by visiting your Facebook Fan Page and then clicking on the profile pic you’re using for your Facebook Fan Page > then look up at the URL in the address bar – you’ll see at the very end of that URL your page ID – just copy the number portion of that ID and paste it into the iFrame code replacing YOUR_PAGE_ID. The settings are by default set to 10 (connections) and 1 (stream). This means your Facebook Fan Box will show 10 fans and the stream will be active (1 = active). You can tweek this if you like – for example here at Social Media SEO, I DO NOT have my stream active – I only want my Fan Box to show 10 of my fans. To turn off the stream, change the “1” to a “0” (0=inactive, or not showing). You can also tweek the height and width to be more customized to your WordPress blog. I actually just recommend deleting that all together because if you don’t, you’ll have a text link underneath your Facebook Fan Box. Of course the link will direct people to your Facebook Fan Page, but you’ve already got a Fan Box on your blog now, so why clutter things up? Hi – thanks for commenting. Can you provide me with a link to your blog? Also, are you using the iFrame code or the standard code provided for the widget? here's my blog . all code not works for me. Hi – the reason you aren't able to add your Facebook Fan Box is because your WordPress blog is not a self hosted blog, but a free version of WordPress. I'm not sure 100%, but I don't believe a Facebook Fan Box can be added to a free version of WordPress. robert, you are right. it's not possible to add a fan box to wordpress.com-blog yet (just wordpress.org). unfortunately. I can’t find the fan box code anywhere on my fan page. I looked and there was no option for one. Did they stop doing it or have they moved it? Even I’m having the same problem. When I took the iframe code for the Like Box and I try to paste it, it disappears.